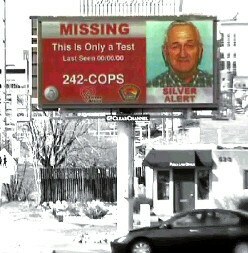 Typically, Silver Alerts last for 12 hours or until the person is found. The program is similar to an Amber Alert, which has been successful at locating missing children. Once you have determined that your loved one is missing, please call 242-COPS. An officer will come to the residence or the place from which the person is missing, and an initial investigation will begin. If the person is not found immediately, the Silver Alert will be issued, notifying all media sources of the importance of finding your loved one as quickly as possible. The alert will contain a photograph and state the missing person’s name, description, age, relevant medical conditions, vehicle type if applicable and their last known whereabouts. If you have previously registered your loved one with Silver Alert, this important information will be on the USB drive in your possession that you have already completed with the assistance of the Department of Senior Affairs (764-6400). You will give the USB drive that contains this vital information to the Albuquerque Police Officer working with you. 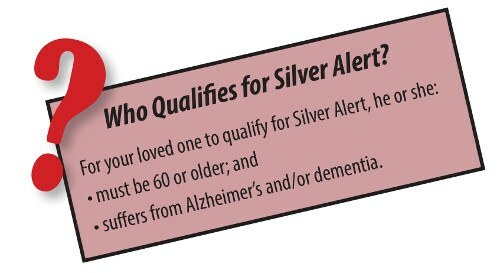 Registration for the Silver Alert Program is on-going. Interested parties may register and obtain a USB drive by contacting the Department of Senior Affairs, at (505) 764-6400.